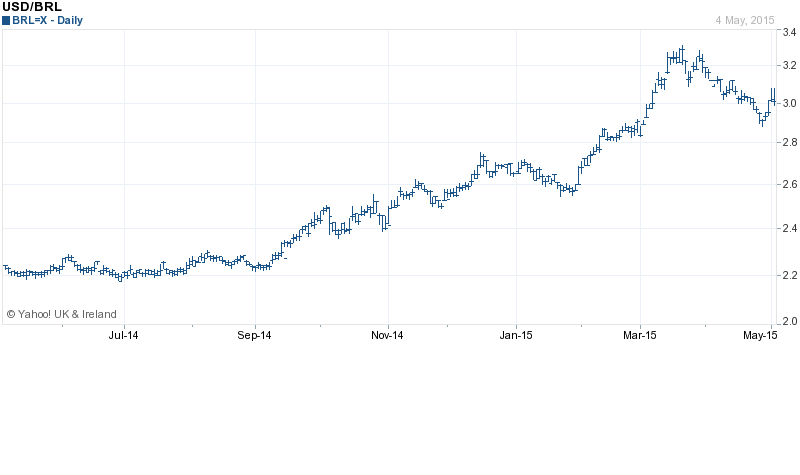 Brazil – Good buy or Goodbye? It is worth remembering that, despite the importance of commodities – and Coffee made fresh lows for the year in September – the largest contributor to Brazilian GDP is services (67%). In the past few years Brazil’s economy has disappointed. It grew by 2.2% a year, on average, during President Dilma Rousseff’s first term in office in 2011-­14, a slower rate of growth than in most of its neighbours, let alone in places like China or India. Last year GDP barely grew at all. It contracted by 1.6% in the first quarter, compared to the same period last year, and is expected to shrink by as much as 2% in 2015. Household consumption registered the first drop, year-on-year, since Ms Rousseff’s left-wing Workers’ Party (PT) came to power in 2003. At the same time, public spending has surged. 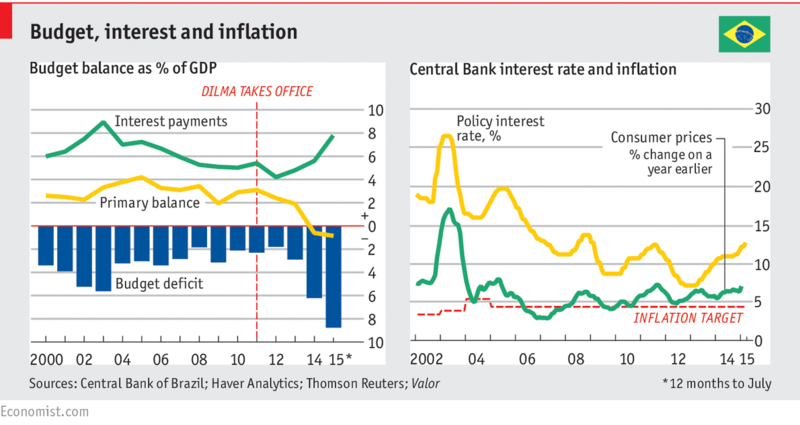 In 2014, as Ms Rousseff sought re-­election, the budget deficit doubled to 6.75% of GDP. For the first time since 1997 the government failed to set aside any money to pay back creditors. Its planned primary surplus, which excludes interest owed on debt, of 1.8% of GDP ended up being a 0.6% deficit. Brazil’s gross government debt of 62% may look piffling compared to Greece’s 175% or Japan’s 227%. But Brazil’s high interest rates of around 13% make borrowing costlier to service. …As the government loosened fiscal policy, the Central Bank prematurely slashed its benchmark interest rate in 2011-­12. This pushed up inflation, which is now above the bank’s self­-imposed upper limit of 6.5%, and way above its 4.5% target. The interest-rate cut has since been reversed. On June 3rd the Bank’s monetary policy-makers raised the rate once more, boosting it to 13.75%, more than a percentage point higher than before the decision to cut. …In the past ten years wages in the private sector have grown faster than GDP (public­-sector workers have done even better). That allowed consumers to borrow more, which encouraged still more spending. Now the virtuous circle is turning vicious. Real wages have been falling since March, compared to a year earlier, mainly because Brazilian workers’ productivity never justified the earlier rises. …unemployment, which has long been falling and dipped below 5% for most of 2014, increased to 6.4% in April. Economists expect it to reach 8% this year. …the government is cutting spending on unemployment insurance (which had risen even when the jobless rate was falling) and on other benefits. Taxes, including fuel duty, are going up. So, too, are bills for water and electricity. …Consumer confidence has fallen to its lowest level since Fundação Getulio Vargas, a business school, began tracking it in 2005. The government has no money to boost investment. Petrobras, the state-­controlled oil giant and Brazil’s biggest investor, is in the midst of a corruption scandal that has paralysed spending: the forgone investment may reduce GDP growth this year by one percentage point. It is hard to see where growth will come from. Worst of all, Ms Rousseff’s policy levers are jammed. She cannot loosen fiscal policy without precipitating a downgrade of Brazil’s credit rating. In fact, her hawkish finance minister, Joaquim Levy, has slashed 70 billion reais off the discretionary spending planned for this year (on top of the modest welfare reforms). Nor can the Central Bank ease monetary policy. That would once again undermine its credibility—and weaken the currency. A depreciating real, which is oscillating around a 10-year low, pushes up inflation; it also makes Brazil’s $230 billion dollar-denominated debt dearer by the day. On September 9th – one week after the Economist article was published – S&P cut Brazil’s bond rating to BB+ – this is “Junk Bond” status. It followed Moody’s downgrade to Baa3 on August 11th. There seems little reason to “Buy Brazil”, but it is when markets look most dire that one should pay the most attention. In May 2015 I wrote about the prospects for Brazil and Russia here – once again, I was anticipating the rebound in commodity prices coming to the aid of these commodity exporters – yet again, I was premature. The economic slowdown in China continues, commodity exporting countries remain under pressure and, from a technical perspective, the GSCI appears to be heading back to test the 2009 lows. My conclusions about Brazilian Real-Estate have become slightly more negative since May. The recent increase in domestic inflation, combined with a rise in unemployment, makes rental yields – ranging from 4 to 6% – less attractive. 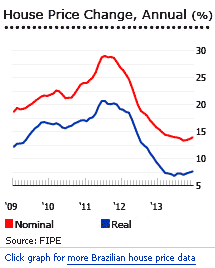 Real yields have grown more negative whilst rental arrears and defaults rise. Other exporting companies account for 36 percent of FX debt. Non-exporting companies with at least 80 percent of their FX debt hedged in domestic derivatives markets account for 17 percent of FX debt. Non-exporting companies (both foreign-owned and domestic firms) with hedge for less than 80 percent of their exposures account for 33.5 percent of NFC FX debt,10 or about 10 percent of total debt (Financial Stability Report, September 2014). I’ve ranked these markets by CAPE to look at valuation from a longer-term perspective. Remember, however, the Bovespa index has only a 14% exposure to Energy and 14% to Commodities; domestic consumption will drive growth for many Brazilian companies – the consumer is likely to be in cyclical retreat as wages and benefits fall. Exporters should thrive due to the currency devaluation but for the broader index these effects will take time to manifest themselves in higher stock prices. My longer-term enthusiasm from May remains undimmed, but I was clearly too early calling the bottom. With China still slowing, the headwinds facing Brazil have yet to fully abate. …if markets react sharply to the continued tapering, then capital flows to developing countries could decrease by as much as 80 percent, destabilizing current account balances, leading to disorderly depreciations of regional currencies, and quite possibly, increasing imported inflation. They estimated that 60% of all capital flows to emerging markets, since the financial crisis, have been a by-product of QE. Corporate debt in emerging market economies has risen significantly during the past decade. The corporate debt of nonfinancial firms across major emerging market economies increased from about $4 trillion in 2004 to well over $18 trillion in 2014. The average emerging market corporate debt-to-GDP ratio has also grown by 26 percentage points in the same period, but with notable heterogeneity across countries. EM Debt to GDP now stands at roughly 70%. The marked decline in EM bond and equity in fund allocations amounted to some 80% of the drop seen during the worst of the taper tantrum in Q2 2013. This has left fund allocations to EM bonds and equities nearly 1.5 percentage points below end-June levels–at just 11%, EM allocations are at their lowest since early 2009. The decline in global investors’ appetite for emerging market stocks has been particularly striking, with EM equity funds suffering more than EM bond funds. Large fund outflows, falling asset prices and marked losses in EM currencies against the U.S. dollar have all contributed to lower allocations. The IIF go on to state that this year EM countries will witness a capital outflow of $541bln for 2015 vs a net inflow of $32bln for 2014. These are the first EM outflows since 1988. What are the options for Brazil? With interest rates at 14.25 percent, there is unfortunately little room for further rate hikes. With short-term domestic rates at these levels and global interest rates at close to zero, one would be hard pressed to argue that remedies used in the 1990s—specifically abrupt interest rate hikes of a high order of magnitude—would make a big impact on reversing capital outflows. If market pressures continue unabated and exchange interventions are ineffective, Brazil might well need to resort to capital controls. A further credit downgrade might follow, and the stage would be set for the type of inevitable crash that many economists imagined they would no longer see. While a crisis cannot be fully avoided—arguably, it is already happening—the government could still take some action to instill confidence. A strong commitment to prudent fiscal management over the medium term might help attenuate market turbulence even if the government’s hands are tied in the short run by political dysfunction. Instituting debt limits as discussed above would be a good start; Poland’s experience is testament to how fiscal credibility can be enhanced through their adoption. In Brazil’s case, debt limits have an additional advantage: They would send the right medium-term signals without being as overtly unpopular as the other measures and reforms the country desperately needs. “Circuit-Breaker” policy proposals and the spectre of capital controls are unlikely to stem capital flight in the near-term, but with EM exposures already back to 2009 levels, I believe we’re nearer the end than the beginning of the repatriation process. For investment to return to Brazil, repatriation of existing investment needs to run its course, corporate bond defaults need to peak and begin to improve, unemployment needs to rise and then begin to decline and the government needs to prove it has the resolve to adhere to a policy of real austerity. 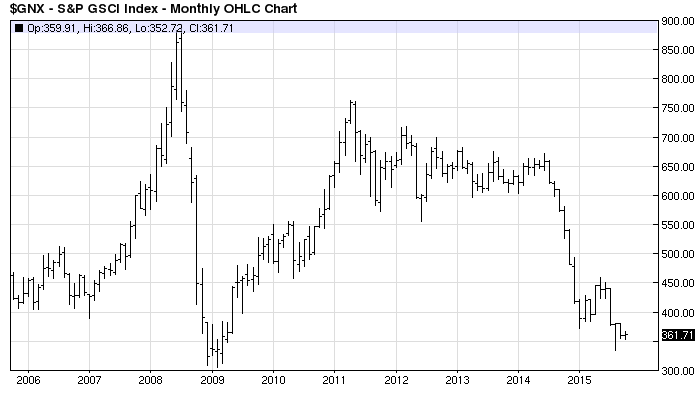 The BRL is the weakest it has been in more than 20 years, it last approached these levels back in October 2002. Foreign Exchange reserves remain high, I would expect the markets to test the central bank’s resolve. Further currency weakness certainly cannot be ruled out. 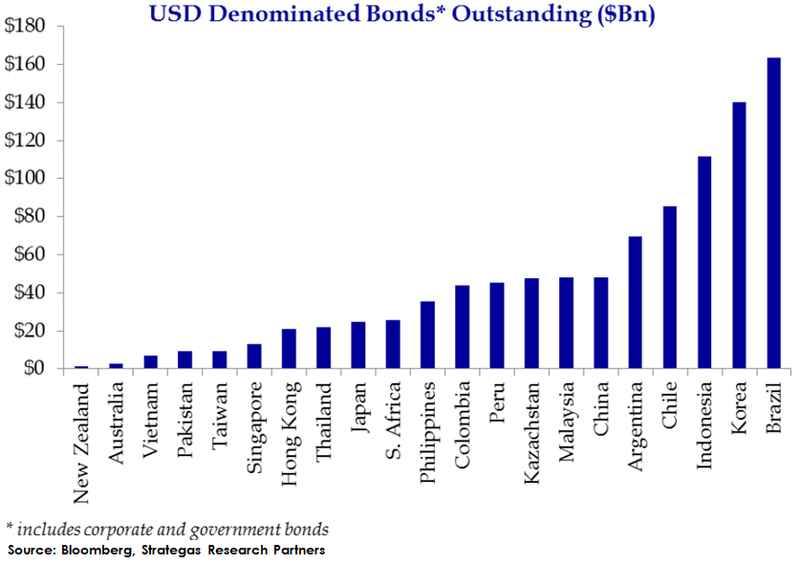 The full impact of recent currency weakness on Brazilian US$ denominated bonds has yet to run its course. Default rates should rise, the Serasa Experian Corporate Default Index rose 13.3% in the period January to August 2015, meanwhile, corporate delinquencies for the month were 16.1% higher than in August 2014. For the contrarian investor this may present an opportunity to buy – personally, I would prefer to see some indication of government resolve to tackle the countries difficult domestic economic issues first. Next year Brazil will host the Olympic Games – this is an opportunity to push through unpopular policies and showcase all the reasons to invest in Brazil. It is always darkest before the light – I shall be watching closely. Broken BRICs – Can Brazil and Russia rebound? When Jim O’Neill, then CIO of GSAM, coined the BRIC collective in 2001, to describe the largest of the emerging market economies, each country was growing strongly, however, O’Neill was the first to acknowledge the significant differences between these disparate countries in terms of their character. Since the Great Recession the economic fortunes of each country has been mixed, but, whilst the relative strength of China and India has continued, Brazil and Russia might be accused of imitating Icarus. In order to evaluate the prospects for Brazil and Russia it is worth reviewing the unique aspects of, and differences between, each economy. According to the IMF April 2015 WEO, Brazil is ranked eighth largest by GDP and seventh largest by GDP adjusted for purchasing power parity. Russia was ranked tenth and sixth respectively. Between 2000 and 2012 Brazilian economic growth averaged 5%, yet this year, according to the IMF, the economy is forecast to contract by 1%. The forecast for Latin America combined is +0.6%. For Russia the commodity boom helped GDP rise 7% per annum between 2000 and 2008, but with international sanctions continuing to bite, this year’s GDP is expected to be 3.8% lower. Brazil’s service sector is the largest component of GDP at 67%, followed by the industry,27% and agriculture, 5.5%. The labour force is around 101mln, of which 10% is engaged in agriculture, 19% in industry and 71% in services. Russia by contrast is more reliant on energy and other natural resources. In 2012[update] oil and gas accounted for 16% of GDP, 52% of federal budget revenues and more than 70% of total exports. As of 2012 agriculture accounted for 4.4% of GDP, industry 37.6% and services 58%. The labour force is somewhat smaller at 76mln (2015). …the Bank of Russia argues that the huge devaluation of the ruble that took place between October 2014 and February 2015 has a minor effect on economic growth. This claim neglects much empirical evidence that sharp devaluations retard investment activity, for two reasons. First, investment technology from abroad becomes more expensive—nearly 80 percent more expensive in the case of Russia. Second, devaluations increase uncertainty in business planning and hence slow down investment in domestic technology as well. Both effects work to depress economic activity in the short term. …2017 is presented as the year of a strong rebound, as a result of cyclical macroeconomic forces. In particular, says the Bank of Russia, growth will reach 5.5 to 6.3 percent that year. It is true that the economy was already slowing down in 2012, before last year’s sanctions and devaluation. It is also true that the average business cycle globally has historically lasted about six years. But this is no ordinary cycle—sanctions are likely to play a bigger role than the Bank of Russia cares to admit. The main reason is their effect on the banking sector, where credit activity is already substantially curtailed, and may be curtailed even further once corporate eurobonds start coming due later this year. The devaluation has exacerbated the credit crunch as interest rates spiked in early 2015 to over 20 to 25 percent for business loans. These effects point in one direction: a prolonged recession. Finally, the Russian government is reducing public investment in infrastructure in this year’s budget to try and cut overall expenditure by about 10 percent. This cutback is going to dampen growth because the multiplier on infrastructure investment is highest among all public expenditures. The Bank of Russia seems to have forgotten to account for this elementary fact of life. Overall, the economic picture may end up being quite different from what the Bank of Russia forecasts. Instead of economic growth of –3.5 to –4 percent in 2015, –1 to –1.6 percent in 2016, and 5.5 to 6.3 percent in 2017, it may be closer to –6 to –7 percent in 2015, –3 to –4 percent in 2016, and zero growth in 2017. This scenario is worth contemplating, as it would mean that the reserve fund that the government uses to finance its deficit may be fully depleted in this period. What then? From this table it is worth highlighting a number of factors; firstly interest rates. Rates continue to rise in Brazil despite the relatively benign inflation rate. The rise in the Russian, Micex stock index has been much stronger than that of the Brazilian, Bovespa, partly this is due to the larger fall in the value of the RUB and partly due to the recent recovery in the oil price. PPI inflation in Brazil remains broadly benign, especially in comparison with 2014, whilst in Russia it is stubbornly high – making last week’s rate cut all the more surprising. Brazilian industrial production continues to decline, a trend it has been struggling to reverse, yet capacity utilisation remains relatively high. Russian industrial production never rebounded as swiftly from the 2008 crisis but has remained in positive territory for the last few years despite the geo-political situation. Remembering that one of Russia’s largest industries is arms manufacture – the country ranks third by military expenditure globally behind China and US – this may not be entirely surprising. Of more concern for Brazil, is the structural nature of its current account deficit, since the advent of the Great Recession. This combination of deficit and inflation prompted Morgan Stanley, back in 2013, to label Brazil one of the “Fragile Five” alone side India, Indonesia, South Africa and Turkey. Russia, by contrast, has run a surplus for almost the entire period since the Asian crisis of 1998. The Government debt to GDP ratio in Russia has risen slightly but the experience of the Asian crisis appears to have been taken on board. Added to which, the sanctions regime means Russia is cut off from international capital markets. In Brazil the ratio is not high in comparison with many developed nations but the ratio has been rising since 2011 and looks set to match the 2010 high of 60.9 next year if spending is not curtailed. A final observation concerns gold reserves. 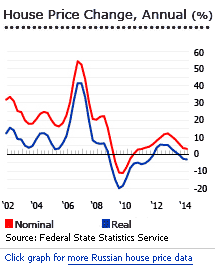 Brazil has relatively little, although they did increase in January 2013 after a prolonged period at very low levels. Russia has taken a different approach, since 2008 its reserves have tripled from less than 400t to more than 1,200t today. There have been suggestions that this is a prelude to Russia adopting a “hard currency” standard in the face of continuous debasement of fiat currencies by developed nation central banks, but that is beyond the remit of this essay. Some observers believed that the whole notion of a grouping of Brazil, Russia, India and China never made any sound sense because beyond having a lot of people, they didn’t share anything else in common. In particular, two are democracies, and two are not, obviously, China and Russia. Similarly, two are major commodity producers, Brazil and Russia, the other two, not. And their levels of wealth are quite different, with Brazil and Russia well above $10,000, China around $ 7-8 k, and India less than $ 2k per head. And the sceptic would follow all of this by saying, the only reason why Brazil and Russia grew so well in the past decade was simply due to a persistent boom in commodity prices, and once that finished, as appears to be the case now, then their economies would lose their shine, as indeed appears to be the case. Throw in that China would inevitably be caught by its own significant challenges at some point, which the doubters would say, is now, then all is left is India, and if it weren’t for the election of Modi recently, there has not been a lot to justify structural optimism about that country recently. …I do believe each of Brazil and Russia have got some challenges to face, that they are not yet confronting, which at the core is to reduce their dependency to the commodity cycle, and while there are many differences between them, they do both need to become more competitive and entrepreneurial outside of commodities and to boost private sector investment. The development has caused much political jawboning but I suspect its impact will be small in the near-term. Looking again at the figures for capital flows, Brazil appeared to be in better shape, but Russian FDI has been positive in every quarter since 2008 until the most recent outflow in Q3 2014. Consumer confidence in Brazil has remained more robust, possibly this is due to innate Latin optimism but it may be partly in expectation of the forthcoming Olympics. The games will take place in Rio, reminding us of the high urbanisation rates in Brazil, 85.4%. This is not dissimilar to Russia at 73.9% but substantially higher than China 54.4% and India 32.4%. Interestingly US urbanisation is 81.4% – but US GDP per capita is significantly higher. …Russia is experiencing large capital outflows, expected to reach $120 billion. Because of Western financial sanctions, they are set to continue. The large outflows erupted in March as investors anticipated financial sanctions, which hit in July and in effect have closed financial markets to Russia. No significant international financial institution dares to take the legal risk of lending Russia money today. The watershed moment was the imposition of the third round of Western sanctions, which cut Russian companies off from the world’s financial markets. Along with falling oil prices (a key market factor), this caused market players to reassess the risks. Before the introduction of sanctions, the ratio of external debt to foreign exchange reserves (at 1.4) was not particularly worrying. But the fact that companies could no longer refinance their debt on external markets necessitated a rethink. It became clear that, with export revenues falling because of lower oil prices, companies would accumulate excess currency in their accounts. The supply of currency in the market from exporters (many of whom also had large debts) declined sharply, while demand from the debtor companies increased. In October 2014 the Central Bank was forced to spend another $26 billion to support the rouble. After that, preserving the country’s reserves became the priority, so in November, the bank’s intervention fell to $10 billion. So everything was in place for a currency crisis and this is why the Russian Minister for the Economy called it “the perfect storm”. The storm was only halted by a sharp increase in the Central Bank’s interest rate and by informal pressure on companies that brought about a speedy decline in foreign exchange trading. 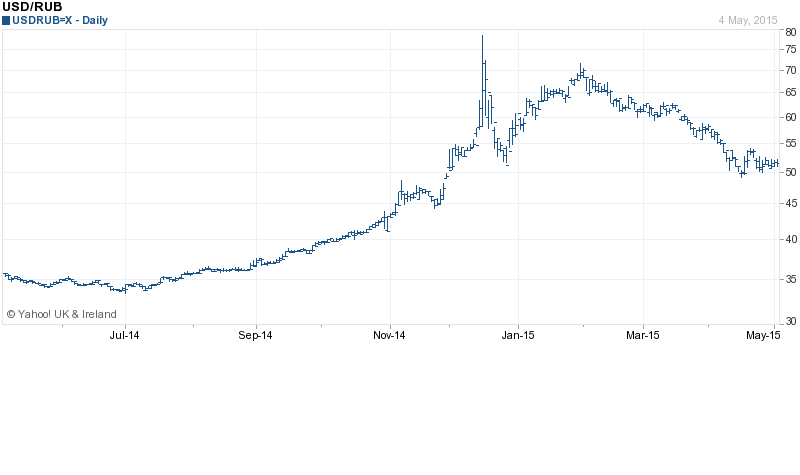 …So the double devaluation of the rouble will be felt in rising price and shrinking consumption. According to the Gaidar Institute for Economic Policy, this will add at least 10–12 percentage points to normal inflation, which will reach 15-20 percent. Import substitution options are relatively limited: large-scale import substitution would require significant investment and, at the moment, the resources for this are not there. And a fall in consumption (as a result of the falling purchasing power of households) will cause a decline in production. According to the Central Bank’s December forecast, GDP in 2015 may fall by 4.5–4.8 percent. This is what the bank calls a “stress scenario”, and it assumes that the oil price will stay at $60 a barrel and Western sanctions will remain in place. In fact, this scenario seems to be the most realistic; any other scenario would involve either the lifting of sanctions or a rise in the oil price to $80 or even $100. The most likely trigger for a future crisis resides in the financial sector. December’s $2 billion bailout of Trust Bank, coupled with news of large and potentially open-ended support for VTB Bank and Gazprombank, highlight the rapidly escalating costs of the crisis for the financial sector as state banks and energy companies face high dollar-denominated debt payments and falling revenues. Rising bad loans, falling equity values, and soaring foreign-currency debt are devastating balance sheets. As foreign banks pull back their support, the combination of sanctions, oil prices, and rising nonperforming loans is creating a toxic mix for Russian banks. So far, a crisis has been deferred by the belief that the central bank can and will fully stand behind the banking system. If any doubt creeps in about the strength of that commitment, a run will quickly materialize. …Sanctions are a force multiplier. Western sanctions have taken away the usual buffers—such as foreign borrowing and expanding trade—that Russia relies on to insulate its economy from an oil shock. Over the past several months, Western banks have cut their relationships and pulled back on lending, creating severe domestic market pressures. The financial system has fragmented. Meanwhile, trade and investment have dropped sharply. These forces limit the capacity of the Russian economy to adjust to any shock. Russia could have weathered an oil shock or sanctions alone, but not both together. 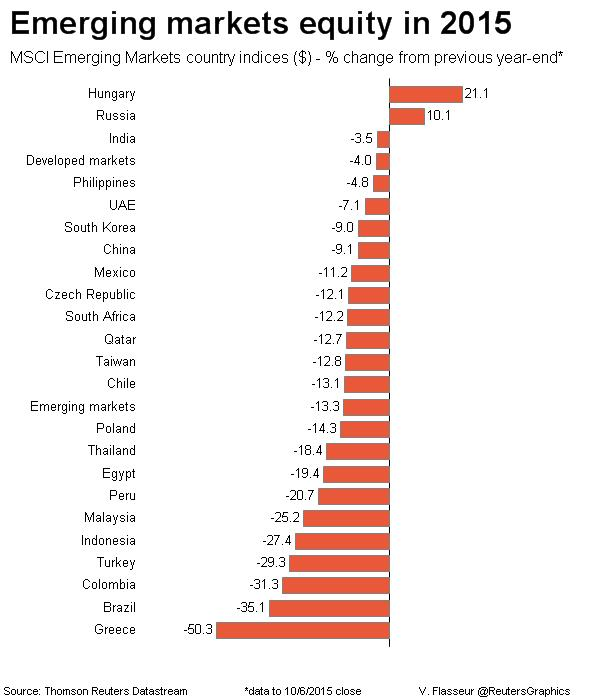 …Measured by the severity of recent market moves, Russia is in crisis. But from a broader perspective, a comprehensive economic and financial crisis would cause a far greater degree of financial distress for the Russian people. Companies would find working capital unavailable; interest rates of 17 percent (or higher) and exchange rate depreciation would cause a spike in import prices; and capital expenditure would crater. All this would generate sharp increases in unemployment and a far greater fall in gross domestic product (GDP) than we have seen so far. Over the past three decades, a precipitous drop in oil prices (and a concomitant sharp reduction in rents) has resulted in economic reforms being undertaken in Russia. Mikhail Gorbachev’s perestroika emerged after the fall in oil prices in 1986. Putin’s earlier, more liberal economic policies were carried out after oil dropped to close to $10 a barrel in 1999. And Dmitri Medvedev’s modernization agenda was strongest in the aftermath of the global recession of 2008–09. Unfortunately, the prospects for a similar surge in economic reform in Russia today are less good. The unfavourable geopolitical environment threatens to change the trajectory of political and economic development in Russia for the worse. By boosting factions within Russia’s policy elite who favour increased state control and less integration with the global economy, poor relations with the West threaten to reduce the prospects for a market-oriented turn in economic policy. As a result, the prevailing system of political economy that is in such urgent need of transformation may in fact be preserved in a more ossified form. Instead of responding to adversity through openness, Russia may take the historically well-trodden path of using a threatening international environment to justify centralization and international isolation in order to strengthen the existing ruling elite. Thus, while Western sanctions were not necessarily intended to strengthen statist factions within Russia and force the country away from the global economy, this may prove to be an unintended but important outcome. Consequently, Russia appears to be locked into a path of economic policy inertia, as powerful constituencies that benefit from the existing system are strengthened by the showdown with the West. While Russia may have ‘won’ Crimea, and may even succeed in ensuring that Ukraine is not ‘won’ by the West, the price of victory may be a deterioration in long-term prospects for socioeconomic development. What caused the RUB to return from the brink was a recovery in the oil price and a slight improvement in the politics of the Ukraine. The Minsk II Agreement, whilst only partially observed, has curtailed an escalation of the Ukrainian civil war. Capital outflows which were $77bln in Q4 2014 slowed to $32bln in Q1 2015. Ironically, the rebound in the currency and appreciation in the Micex index will probably delay the necessary structural reforms which are needed to reinvigorate the economy. 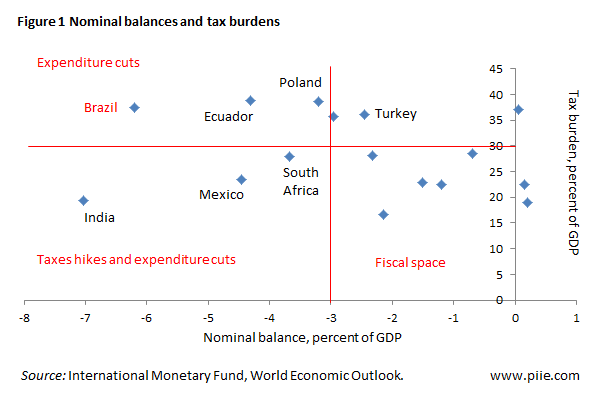 …Ideally, Brazil would offset this fiscal squeeze with looser monetary policy. But because of the country’s hyperinflationary past, as well as more recent mistakes—the Central Bank bent to the president’s will, ignored its inflation target and foolishly slashed its benchmark rate in 2011-12—the room for manoeuvre today is limited. With inflation still above its target, the Central Bank cannot cut its benchmark rate from today’s level of 12.25% without risking further loss of credibility and sapping investor confidence. A fiscal squeeze and high interest rates spell pain for Brazilian firms and households and a slower return to growth. …Yet the president’s weakness is also an opportunity—and for Mr Levy in particular. He is now indispensable. He should build bridges to Mr Cunha, while making it clear that if Congress tries to extract a budgetary price for its support, that will lead to cuts elsewhere. The recovery of fiscal responsibility must be lasting for business confidence and investment to return. But the sooner the fiscal adjustment sticks, the sooner the Central Bank can start cutting interest rates. The Brazilian economy has all the characteristics of a country under the tutelage of an International Monetary Fund (IMF) program. The list of its economic imbalances is endless: a rampant current account deficit in excess of 4 percent of GDP, an exchange rate that has long been overvalued but that has collapsed in just a few months, a public debt ratio to GDP in a rapid upward trend, a fiscal deficit of over 6 percent of GDP despite a high tax burden, an annual inflation rate of nearly 8 percent that has unanchored inflation expectations, an accelerated growth of wages well above their very low productivity. The scandal of the oil company Petrobras, the latest in a long series of political corruption scandals, is the straw that could break the back of investors’ patience, the tolerance of Brazilian citizens, and the stamina of the world’s seventh largest economy. The Petrobras scandal has far-reaching ramifications throughout the economy and society, paralyzing activity and collapsing both business and consumer confidence to unprecedented levels. The mass street demonstrations of recent weeks are the most graphic example of this dissatisfaction. Consider the most common explanations for why Brazil’s investment rate shows persistent apathy: Excessive taxes levied on businesses discourage fixed capital formation; poor infrastructure—including ongoing problems in the energy sector—increases production costs; high wages relative to worker productivity weigh on firms, hampering investment; an opaque business environment characterized by obsolete and excessive licensing requirements reduce firms’ incentives to invest; an institutional environment marked by subsidized lending that favors certain firms over others misallocates scarce domestic savings; “state capitalism” and excessive government intervention crowd out the private sector. Evidently, all of these reasons have a role in explaining investment inertia. But, importantly, they are all homegrown. … Perhaps Brazil’s sclerotic investment has something to do with its long-standing lack of openness. It is no mystery that Brazil is one of the most closed economies in the world according to any metric that one chooses to gauge the degree of openness. It is no coincidence that this is also the most striking difference between Brazil and its emerging-market peers: Brazil is more closed than Mexico, Colombia, Peru, and Chile; all members of the Pacific Alliance, their growth rates are higher than Brazil’s. Brazil is also less open than India, China, Turkey, and South Africa. There is an extensive academic and empirical literature on the relationship between investment and openness (see, for example, the Peterson Institute’s video on trade and investment). Several research papers show that the more open an economy is to international trade, the more foreign direct investment it receives. The more foreign direct investment it receives, the greater the availability of resources for domestic investment. Competition is also crucial: Economies that are more open induce greater competition between local and foreign firms, creating incentives for innovation and investment by domestic companies. Unfortunately, Brazil is still fairly close-minded when it comes to these issues. Fears of losing market share and the old litany of “selling the country to foreigners” still dominate the national debate. Platts reported that Iron Ore prices (62% Fe Iron Ore Index) had risen since the end of April to $57.75/dmt CFR North China, up $2.25 on 4th May. It is probably too soon to confirm that Iron Ore prices have bottomed but with oil prices now significantly higher ($60/bbl) since their lows ($45/bbl) seen in March. Copper has also begun to rise – perhaps in response to the performance of the Chinese stock market – rising from lows of less than $2.50/lb in January to $2.94/lb this week. The Russian index is clearly more exposed to energy, 48% and commodities, 12%, than the Brazilian index, where the weightings are 14 % each for energy and commodities. It is important to note that the Bovespa index adjusts for the “free-float” for each stock whilst Micex does not, however under Micex rules no stock may account for more than 15% of the index. The free-float adjusted weight of energy and commodities is therefore 18% and 4% respectively. On the basis of this analysis, currency fluctuation has been the predominant influence on stock market returns, followed by energy and commodity prices. The PE ratios of Micex and Bovespa at roughly 8 times, are undemanding but neither the economic nor the political situation in either country is conducive to long term growth. I expect both markets to continue to recover, although Micex will probably fair best. Longer term, economic reform is required to raise the structural rate of growth. One measure of an economically secure homeland is women’s willingness to raise children with the expectation of opportunities for good health, education and livelihoods. On that front, Russia confronts a perfect storm – as fertility rates plummeted to 1.2 births per women in the late 1990s and now stand at 1.7 births per women. “Russia’s population will most likely decline in the coming decades, perhaps reaching an eventual size in 2100 that’s similar to its 1950 level of around 100 million,” write demographers Joseph Chamie and Barry Mirkin. The country has high mortality rates due to elevated rates of smoking, alcohol consumption and obesity. Investment on healthcare is low. Over the next decade, Russia’s labor force is expected to shrink by about 15 percent. Other countries with low fertility rates turn to immigration to pick up the slack. While immigrants make up about 8 percent of Russia’s population, the nation has a reputation for nationalism and xenophobia, and fertility rates are even lower in neighboring Belarus, Ukraine and Lithuania, all possible sources of immigration. Brazil has better demographic prospects in the near term, but its population growth is now not much above the world average and by 2050 it too will be entering a demographic “Götterdämmerung” of declining population. A freer, more open economy is the most efficient method of deflecting the effects of the long term demographic deficits – stock markets reflect this in their risk premiums. …the major headwinds against Brazil are domestic. The fact that China is slowing down is no longer a fright factor. What keeps investors up at night is the possibility of Brazil losing its investment grade. But last month, Standard & Poor’s credit analysts were in Brasilia and left saying that a downgrade to junk was unlikely. There is the risk of impeachment and the resignation of Finance Minister Joaquim Levy, but that is already priced into the market with local interest rate futures trading over 14.35% compared to the actual benchmark rate of 12.75%. Moreover, the impeachment of Dilma Rousseff and the resignation of Levy are worse case scenarios with low probabilities. Worries over energy rationing have subsided. I believe Brazilian bonds offer good value, even at these levels, the central banks has taken a draconian approach to inflation and the BRL has recovered some of the ground it lost during the last year. Exports to the US should improve and signs of a recovery in European growth will benefit the BRL further. …In a March 11 note, Russia’s Goldman Sachs analysts wrote “Russian bonds are both cyclically and structurally under-priced,” in a big part due devaluation expectations of the ruble stabilizing. I remain less convinced about the value of Russian bonds but with a low debt to GDP ratio they may perform well. As inflation declines in both countries their bond markets will continue to rise in expectation of further central bank rate cuts. This will also support stocks but bonds will lead the rally, especially if future growth in Brazil or Russia should disappoint.